A Refreshing and Vitalizing Leadership and Management training event, designed to fine-tune your valuable Human resources. Develop more coherence and Flow by reducing interference, and tune compatibility in management teams. 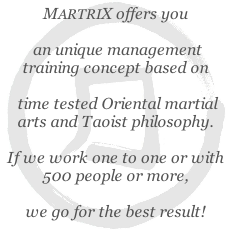 MARTRIX Management training like Martial Arts is about results, it is challenging, fun, active and synergetic. DISCOVER YOUR STRENGHT ON THE WORKING FLOOR WITH A SMILE! 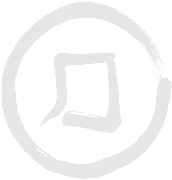 MartriX Management & Leadership training is an alchemistic concept of Martial arts (Taikiken, Taijiquan, Qigong), Taoism and contemporary management training. In our training we use interactive multi discipline concepts to create a powerful and inspiring learning sphere. 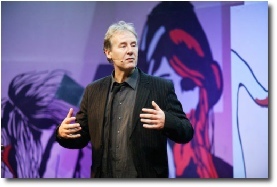 We work on themes like personal effectiveness, team balancing, leadership and conflict management. Our MartriX trainers guide the participants through their personal learning moments. 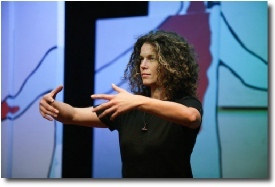 But of course it has not to go so deep, a MartriX martial art training also can be used as a welcome relaxing and energizing intermezzo during a demanding management training, or as an independent workshop. No two humans, organisations or companies are exactly the same, so we offer made to measure products to suit your personal (company) needs. A management training that helps you to get your feeling working in daily situations at the working floor. ‘The Feel’ is intuitive awareness in action, meditation in slow motion, coordinating body and mind. You will experience how to move a natural way, round on the outside, square on the inside. It will make you more aware of your interactions with others and your position in life. A MartriX training is great fun to do. A completely different way of moving and thinking, energizing and challenging. After a MartriX management training you feel recharged and refreshed. For booking a MartriX company training, special wishes or more information, please use following request form or feel free to send us an e-mail.